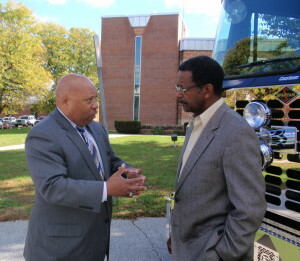 Coatesville City Manager Kirby Hudson (left) chats with City Council President David C. Collins outside City Hall on Tuesday. Contrary to appearances, the City of Coatesville’s next permanent police chief may be just a few steps shy of selection. City Manager Kirby Hudson said today that he reached out to Greg Cary a couple of weeks ago. Cary, the regional external affairs manager for PECO Energy and a former supervisory police officer in Caln Township, assembled a well-credentialed, police-chief search committee in early August – a group whose efforts were ultimately stymied by City Council. Cary said he brainstormed with the other three law-enforcement members of the committee: Eugene Dooley, police chief in East Whiteland Township and a former homicide division chief for the Philadelphia Police Department; Tyree C. Blocker, a retired major in the Pennsylvania state police, where he directed the Bureau of Drug Law Enforcement; and Keith Sadler, police chief for the city of Lancaster and a former chief inspector with the Philadelphia Police. Rather than start from scratch and re-advertise the position, Cary said the group decided to serve as executive head-hunters and shifted into recruiting mode – the method most major police departments use. The suggestion of one individual, who has not yet been identified publicly but agreed to be considered, was greeted enthusiastically by the group, Cary said. “If this works out, I think people will be very impressed with this person’s background,” Hudson added. 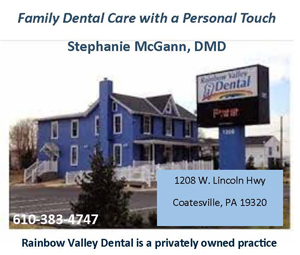 Hudson said a meeting will be scheduled sometime next week so the candidate can interact with other members of the search committee, who include Marc Hanlan, a longtime consultant and author who specializes in change management for the business, public and military sectors; Harry Lewis Jr., board chairman of the Brandywine Health Foundation and a longtime Coatesville educator; Rev. Randall Harris of Tabernacle Baptist Church; William Lambert, the president of the Coatesville NAACP; and Jack Crans, chaplain of Chester County Prison and founder of Coatesville’s City Gate Mission and County Corrections Gospel Mission. Council members Joseph Hamrick and C. Arvilla Hunt are non-voting members of the selection committee. Members of the media will be invited to observe the process to ensure transparency, Hudson said. If the committee has a positive response, Hudson said he will not hesitate to recommend the person to City Council. If any snags occur, the law-enforcement segment of the committee will continue its recruiting efforts, Hudson said. The vacancy was created when the city’s former chief, Julius M. Canale, ended his day-to-day contract with the city in early July after taking an early-retirement option in May. Canale, a veteran of the department, was passed over for the chief’s position in 2007 because he did not meet the posted qualifications. In April 2009, City Council decided to forgo those requirements and promoted Canale after the departure of Chief William Matthews, who had sparked controversy because he was not the choice of a former search committee and was not Act 120-certified. Since then, the city has generated criticism for its delay in finding a permanent leader for a department that has been plagued with litigation. In August, City Council appointed James Bell, a former director of public safety at Cheyney University, as interim chief, a choice that prompted a no-confidence vote from the police union. The union cited Bell’s failure to meet the advertised position’s qualifications: Act 120 certification, state training that qualifies officers to make an arrest and carry a gun; command experience as a chief in a municipality at least as large as Coatesville’s 13,100 residents, or as a supervisor in a department serving at least 30,000; and a bachelor’s degree. Assisted by the search committee, Hudson offered City Council a permanent option in early September, but council failed to muster majority approval for his choice: Maj. John “Jack” W. Laufer III, a respected, decorated state police veteran. Laufer withdrew his name, and an attempt by some members of City Council to convince him to change his mind fell short. At least two City Council members have expressed concern that Hunt wants Bell, a longtime family friend, to continue to have a supervisory role in the department. Hunt did not immediately return an email seeking comment. Hudson also said positions of rank within the department are based on the results of Civil Service exams and that he has already had discussions with the commission to set up those tests.